Blair said last month he supported regime change in Iraq even without evidence of weapons of mass destruction. 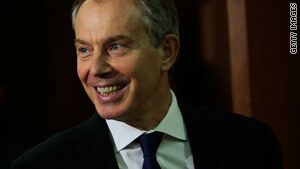 London, England (CNN) -- Former British Prime Minister Tony Blair will testify in public about the invasion of Iraq on January 29, Britain's Iraq Inquiry announced Monday. Blair said in an interview last month that he would have removed Saddam Hussein even without evidence of weapons of mass destruction in Iraq. The inquiry is running independent hearings looking into the decisions that led up to the 2003 invasion and governed Britain's involvement in the war. Former Defence Minister Geoff Hoon and former Foreign Secretary Jack Straw are due to testify later this week. Blair's former spokesman denied last week that intelligence had been "sexed up" to promote the case for war. Alastair Campbell also testified that his former boss was determined to disarm Iraqi leader Saddam Hussein. But he told the Inquiry Blair had never been in a "rush to war" and that he regarded military action only as a last resort. Inquiry members pressed him hard on a 2002 British intelligence document that claimed Iraq could launch weapons of mass destruction within 45 minutes -- a key piece of the Blair government's case for war. Campbell denied that politicians pressed intelligence agencies to reach particular conclusions. "At no point did anybody from the prime minister down say to anybody in the intelligence services, say 'Look, you've got to sort of tailor it to fit this argument, that argument," Campbell said. The intelligence document came out in September 2002 and detailed the threat posed by Iraq. It is most famous for saying that Iraq could "deploy chemical or biological weapons within 45 minutes of an order to do so."